Looking around some parts of Britain, you could be forgiven for thinking that the country had somehow drifted up into the Arctic Circle. What better time, then, to follow the example of the Eskimos and construct your very own igloo? Evolving through trial and error over hundreds of years, the igloo is the ultimate snow shelter. Capable of reaching internal temperatures of up to 16 degrees Celsius, a wellconstructed igloo in sub-zero temperatures provides a snug and cosy den that will shield its occupants from the biting winter wind. 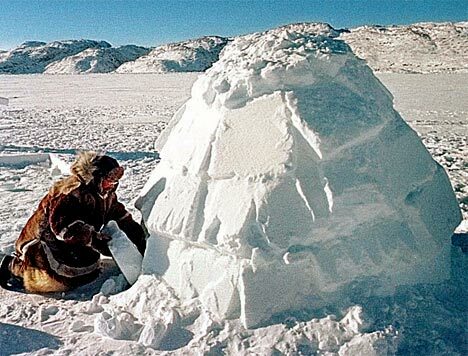 The Eskimos occasionally built them so large that it was possible to hold singing, dancing and wrestling competitions inside them, lining the inner walls with skins in order to make them warmer. Snow shelter: The igloo has evolved through trial and error over hundreds of years. Yet whether large or small, the simple building principles behind the igloo remain the same. If constructed correctly, an igloo should be strong, solid and secure. So strong, in fact, that in the Arctic, polar bears are known to occasionally climb on top of abandoned igloos the better to survey the surrounding terrain. Although you’ll be hard-pressed to find a polar bear to sit atop your igloo, follow our step-by-step guide and with the right snow conditions, a bit of practice and a willing helper or two, an igloo can be constructed in a couple of hours. An igloo large enough to shelter two or three people should have an internal diameter of at least 6ft (2m). Get the tallest member of your building crew to lie down in the snow and make a socalled “snow angel” by waving their arms and legs along the surface of the snow, to create a large, angel-shaped indentation. Complete the circle by tracing around the outline with a stick or a ski pole. A solid foundation is necessary for the structural stability of your igloo. Using boots or snowshoes, stamp over your chosen spot, so the snow is compacted into a solid platform. When you’re done, the snow should be firm enough to support the full weight of a person without leaving deep footprints. Your igloo should be built from compacted blocks of snow that are around 18-24in long, by 9-12in thick, by 12-18in tall. In colder countries, these can be cut straight from the ground but in Britain it is usually best to create a large shovelled pile of snow, then pack it and stamp on it to harden it, before cutting your blocks with a shovel or saw. Alternatively, pack a large plastic bucket with snow and, using the same principle as a sand castle, tip it upside down to create a mound of hardened snow from which a block can be cut. Place your first set of blocks end to end around the circular site prepared earlier. Ensure they are planted firmly on the surface. To improve the strength of the igloo, each of the blocks should be “mitred”, i.e. each block should be cut at a matching angle so they fit snugly together to form a circle. Once the first circle of blocks has been laid, cut a gradually sloping vertical ramp in the top of the blocks. Also, make sure each of the blocks is angled slightly inwards towards the centre of the igloo. This will enable the blocks placed on top to lean further inward, eventually creating the smooth, archshaped profile of the igloo. Using rectangular blocks the same size as the original, begin to stack your blocks on top of the ramp, starting where the ramp is at its lowest. As the blocks are added along the spiral ramp, the igloo will begin to grow. Before the wall gets too high, make sure a helper stands inside the igloo to help with the construction. This person should be willing to stay inside until the igloo is complete. Once you have stacked and shaped the blocks in an upward, inward circular spiral, the only space left should be a small opening at the very top. It is time to cut and place the cap block. Select a block that is slightly larger than the opening in the top. Taper the sides of the block to match the taper of the hole in the dome. With the assistance of the person inside the dome, carefully place the block into position, being careful not to lean against the igloo walls, which could easily collapse. With the dome now complete, cut an arch-shaped entry into the side of the igloo (do not make the entrance before the dome is complete, as this will weaken the structure and increase the likelihood of it collapsing). The entrance should be no larger than 2ft square. At the same time, cut a fist-sized ventilation hole near the top of the dome. Place two large blocks on each side of the entrance hole to create a V-shaped tunnel. Alternatively, cut and stack smaller angled blocks so they curve inwards, to create an arch.